Zimbabwean President Robert Mugabe's party has won a huge majority in parliament in this week's elections, officials say. With most seats declared, the Zimbabwe Electoral Commission said Zanu-PF had won 137 seats in the 210-seat chamber, just short of two-thirds. Results in the presidential race have yet to be announced. 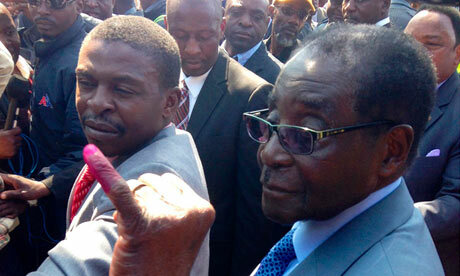 Mr Mugabe's main rival, Prime Minister Morgan Tsvangirai, has already dismissed the election as "a sham". Mr Tsvangirai, 61, who heads the Movement for Democratic Change (MDC) and is running for president against Mr Mugabe, said the vote was "null and void". A local monitoring group has also said that the poll was "seriously compromised". However, the two main observer groups have broadly endorsed the election, saying it was free and peaceful. Earlier reports from the Zimbabwe Electoral Commission (ZEC) said Zanu-PF had won 142 seats but this was later corrected following some recounts. The AFP news agency reports that 186 seats have been declared with 24 results still to come. If Zanu-PF clinches a two-thirds majority it will be able to change Zimbabwe's constitution.